You may register for the waitlist. The Big Wave Classic is open to girls and boys ages U8 thru U16. We're offering a 7v7 option for U8s, a 9v9 option for U10s, and a 11v11 option for U12s. Teams will be grouped based on their level to provide an enjoyable and competitive tournament for all participants. We are committed to quality vs quantity so please register and complete the tournament application as soon as possible. 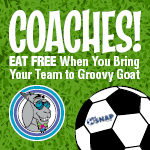 Please Email Zack@snapsoccer.com for all your tournament needs!